This month, the dark hours far outnumber the light ones. Already, the outside temperature rarely pokes above freezing, and the nights drop into the teens above zero. The ground is hard frozen. If you want to dig a hole, or paint something outside, you’ll have to wait until June 2000. We’re happy to report that all of the facilities at KNOM are ship-shape, ready for another long, tough Alaskan winter. As we slip into the dark, cold months, we pray in thanksgiving for your continuing support. Our mission survives day by day thanks to your good charity, and we pray daily for you and your intentions. Please stay with us, won’t you? May Our Lord shower many blessings upon you. BY ALL ACCOUNTS: (left) In his last free week before returning to the seminary for the fall, former KNOM volunteer Ross Tozzi helped close out the KNOM books, and performed his annual informal audit of our mission for the Diocese of Fairbanks. 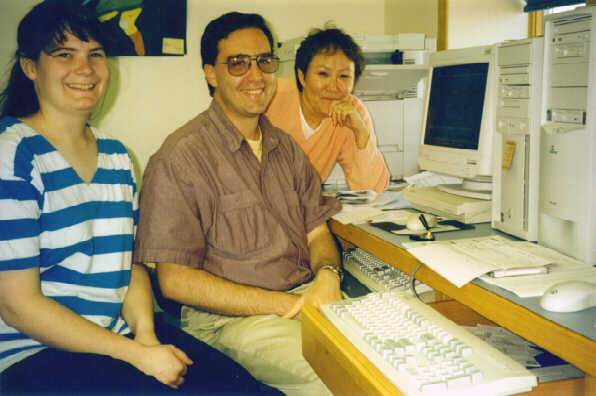 Shown at the computer with Ross, from left, are business assistant Connie Albers and business manager Florence Busch. Ross studies at Mount Angel, Oregon, and hopes to be ordained to the priesthood in two years. There’s a list on my refrigerator of things I need to do, things I need to get. “Pray” and “love God” are missing from that list. It’s not because they’ve been done and crossed off. Lord, please help me to place You at the top of my list and make prayer so natural that the reminder is not needed --because it is written on my heart. top “RADIO STATION OF THE YEAR!” October 16th, KNOM general manager Tom Busch will accept KNOM’s Gabriel Award for the fourth year in a row. It’s the most coveted honor in American broadcasting. Thanks to our small dedicated staff and your prayers and financial help, this tiny mission radio station in remote Nome, Alaska continues to overwhelm the public service efforts of major big city stations. As he has in the past, Tom will accept this great nationwide honor on behalf of you, who keep our signal beaming strong throughout isolated western Alaska. Thank you! 25 YEARS AGO: October 1974: Nome’s electric lines, in terrible repair, caused a power outage every windy day. KNOM’s emergency generators were straining to keep up. At the studio, the emergency kicker was 30 years old, originally built for the Army in World War II, given to KNOM after long use at the remote Catholic mission of Holy Cross on the Yukon River. A month later, KNOM’s generators would be called to a severe test, during Nome’s worst disaster in forty years. INSPIRATIONAL SPOT: Eternal life is not what happens after we die. Eternal life is what happens when we start to live as a son or daughter of God. Eternal life begins the moment that we hear and follow Jesus’ voice. And because Jesus is the One who has defeated death, those who follow His voice will walk right through death like an open door. 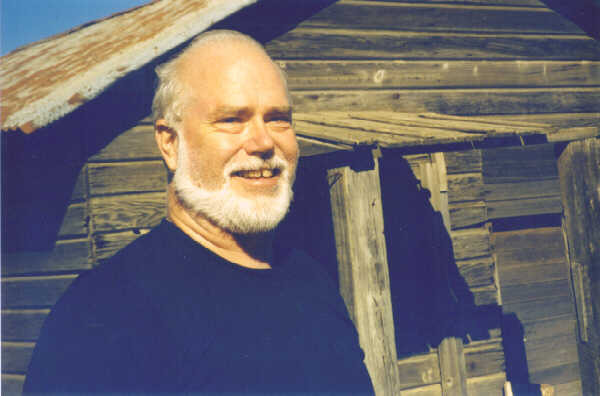 www.knom.org is KNOM’s Web site, with “Nome Static” photos in color and lots of other pictures and information. Between 150 and 300 people visit our home page every week. Are you one of them? You’re welcome to join us! If you’re not a computer “guru,” you might ask a niece or a nephew, or a grandchild, to locate KNOM using their computer. VISITING (left): Former Nome pastor Fr. Chuck Peterson, SJ passed through Nome in early September. After years in Alaska, Fr. Chuck now works in native ministry in the Pacific Northwest. God commands you to pray, but forbids you to worry. full size SOMETHING TO SPOUT OFF ABOUT: Berrypicking on the tundra in early September, business manager Florence Busch happened to sight five killer whales swimming in the Bering Sea. 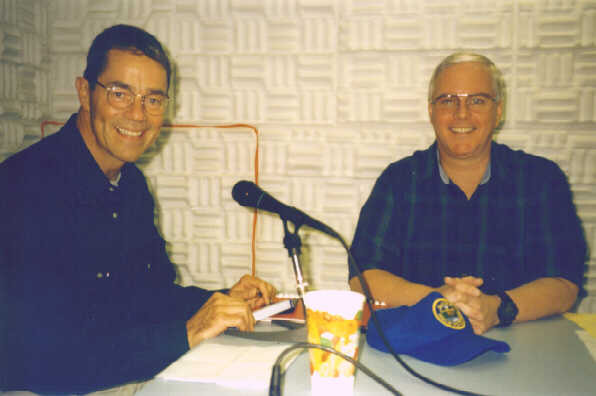 ALASKA GOVERNOR TONY KNOWLES (at left) visits with KNOM general manager Tom Busch in Studio C moments before going on the air September 2nd. The governor had asked to appear on a live call-in program on KNOM to discuss the region’s poor fishing with villagers in our vast listening area, which covers about 100,000 square miles of rural Alaska. Words to that effect were said by St. Ignatius of Antioch as he approached martyrdom in the lions’ arena. Ignatius was bishop of Antioch, an Assyrian city, in the first century. He may have been a disciple of the apostle John, and even installed in office by St. Peter. Ignatius had been a bishop for some forty years when he was arrested for professing to be a Christian and forcibly brought to Rome to be executed. At that particular time, persecutions were erratic, and Christians were cautioned to neither flee, nor provoke martyrdom. But Ignatius must have stood out as an aggressive leader. Like St. Paul before him, Ignatius made good use of the sail to Rome, visiting the local Christian communities during port calls. Also like Paul, Ignatius dictated instructive letters to churches. Written in about the year 100, those letters are important documents in the formation of the Christian church. The feast day of St. Ignatius of Antioch is October 17th. top YOUR STAMP HELPS! It sure does. We’re happy to provide postage on our return envelopes, but if you add a 33¢ stamp, the Post Office will reimburse us for that amount, and it’s an extra gift. Thank you! Please consider adding missions like KNOM to your will. This final gift of a lifetime can foster many good works. At KNOM, our safe, efficient buildings, constructed between 1991 and 1993, and our signal upgrade to 25,000 Watts in 1998 were only possible because of these major gifts. All bequests to our Alaska Radio Mission are set aside for major long-term improvements and for use during emergencies. Meet KNOM’s newest volunteer, Victoria (left). 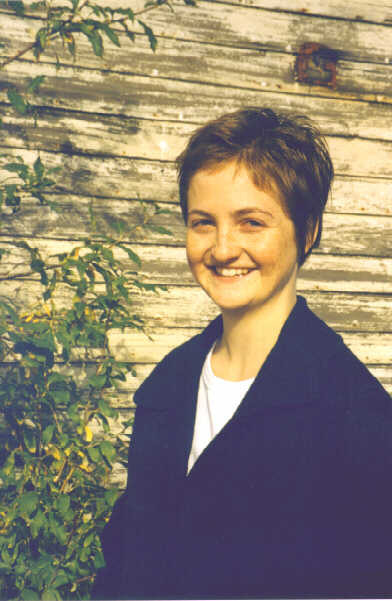 From Pelham, NY, Victoria is a 1999 graduate of Providence College, where she majored in political science. Victoria joins KNOM as news reporter. Please join us in welcoming her! SO FAR THIS YEAR: KNOM has broadcast 24,750 Inspirational Spots, and an equal number of educational ones. Thank you for making our work possible. INSPIRATIONAL SPOT: Hope is hearing the melody of the future. Faith is dancing to it today. OUR PLEDGE TO YOU continues true, as it has for 33 years: We respect your privacy, and will never give or rent your name to anyone. But then, one day, after looking for food, he arrived home to find his little hut in flames, the smoke rolling into the sky. The worst had happened. Everything was lost. The man was stunned with grief and anger. The next time your little hut is burning to the ground...it just may be a smoke signal that summons the grace of God.